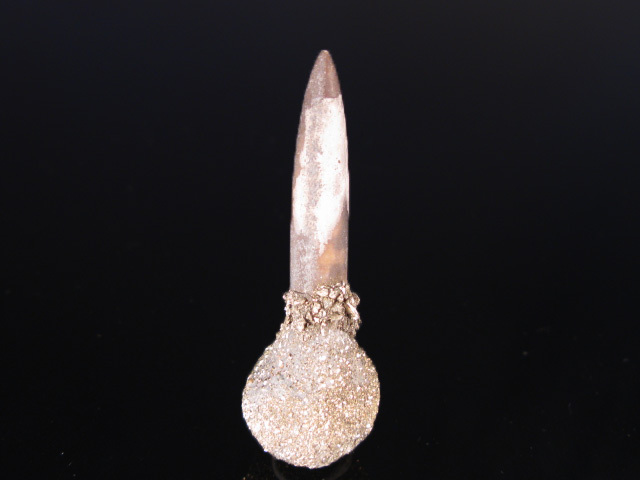 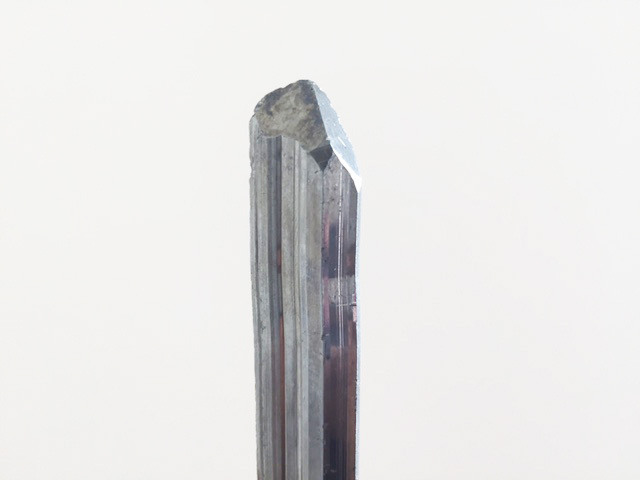 An excellent stibnite specimen that is well over 100 years old, from *the* locality for the species. 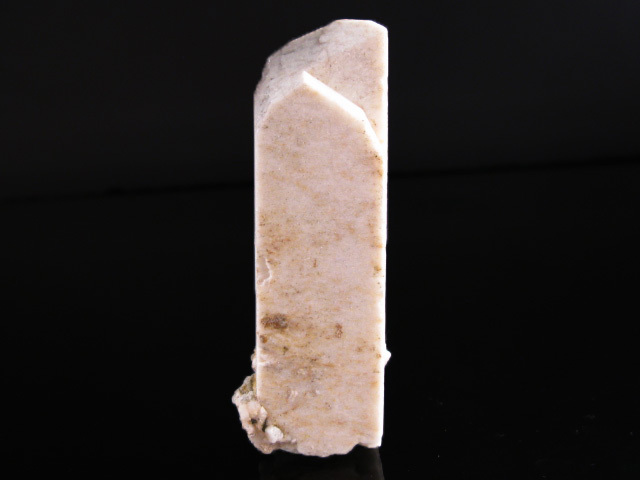 This piece is in excellent condition, both given its age, and compared to others I have seen. 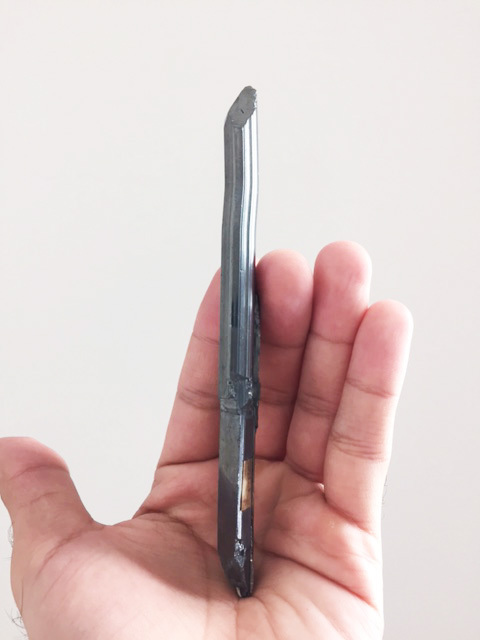 Ichinokawa stibnites remain elusive classics, though are mentioned in practically all the texts where stibnite is discussed, and given their near mythic reputation, I would even say that a collection of worldwide minerals is not entirely complete without some representation from this mine. 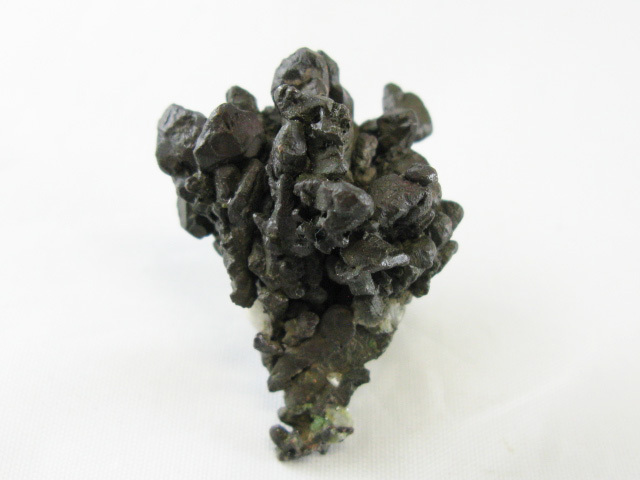 Ichinokawa set the standard for the species, even against the glut of Chinese examples that have flooded the market since the 90's, nearly one hundred years after Ichinokawa was operational. 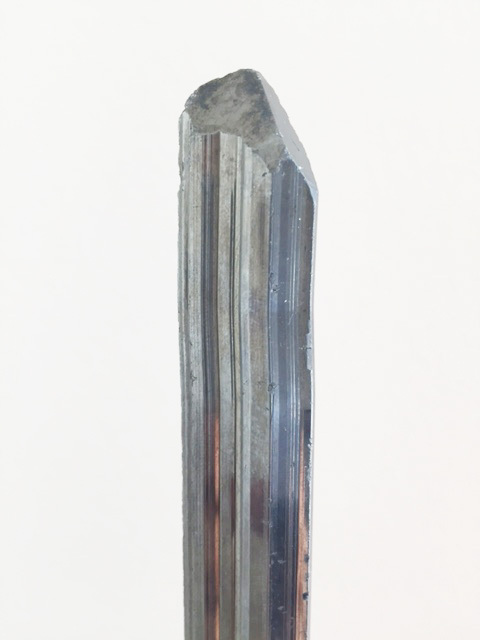 I heard a story once from a museum curator, that in the area around the mine, villagers would even use massive stibnite crystals as fence posts-- I'm not sure if it's true or not, but the thought is mesmerizing. 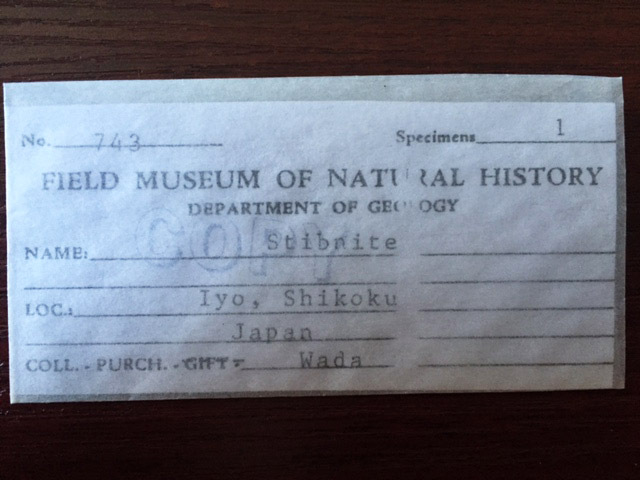 This example has particularly good provenance as well-- Ex. 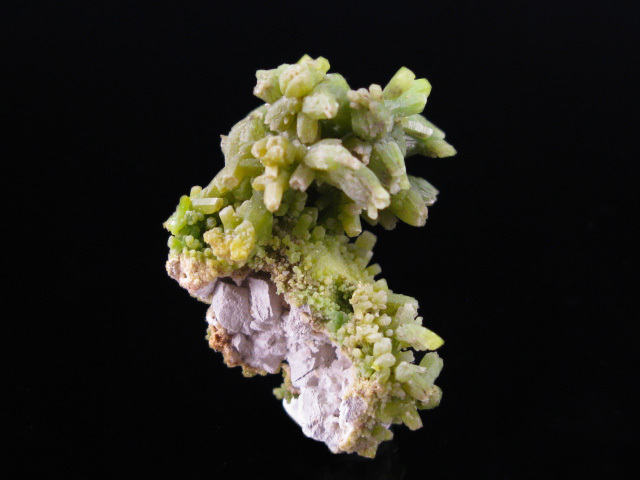 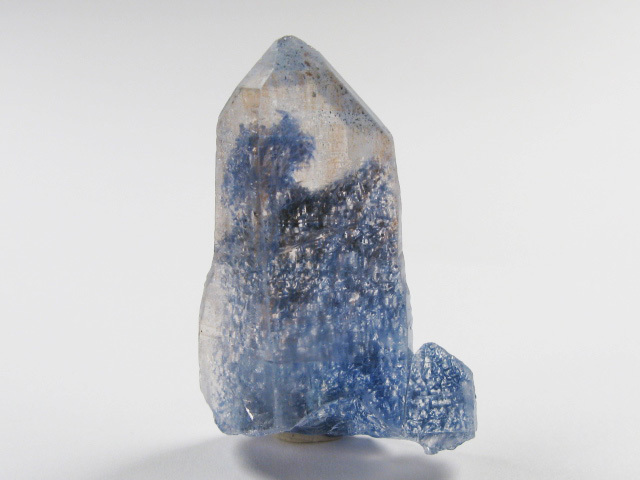 Field Museum (Chicago) and previously in the Wada collection (attribution on the Field Label) considered one of the preeminent collections of Japanese minerals. 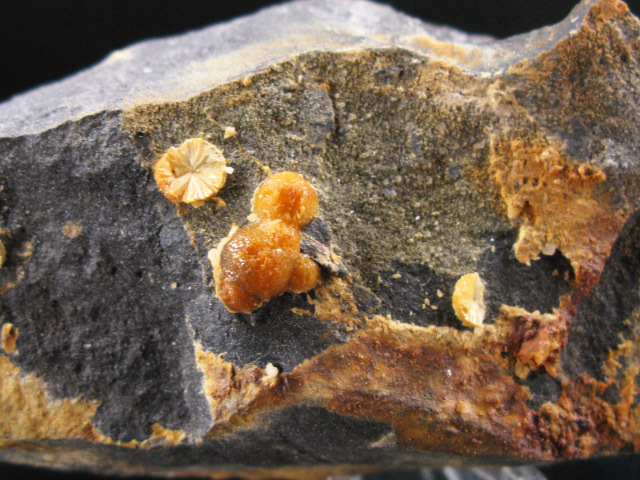 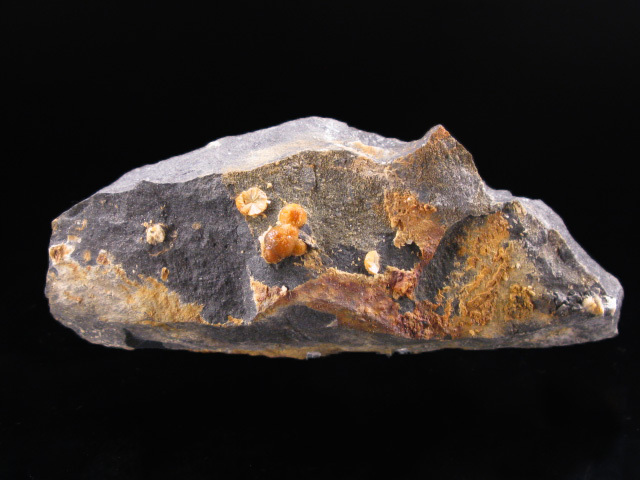 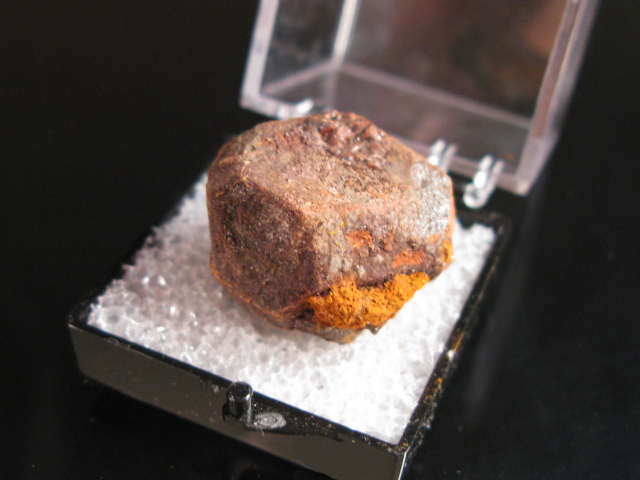 A very rare matrix example of this unusual and rather playful mineral-fossil combination. 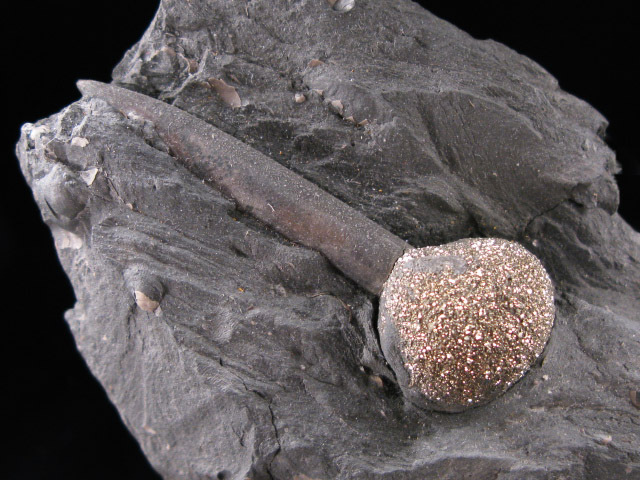 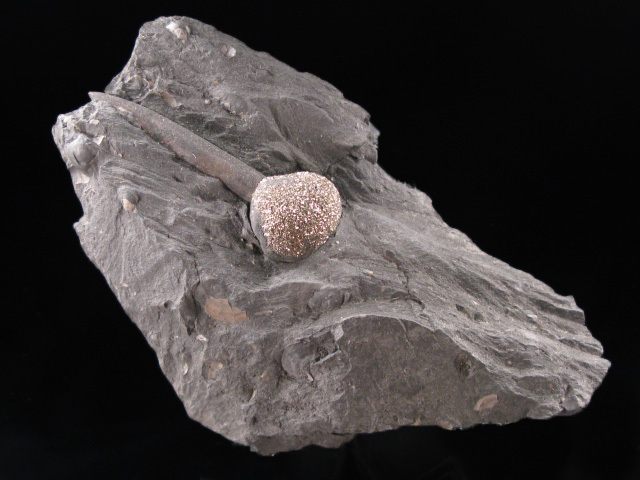 The tubelike shaft is the remnant of a squid-like creature called a belemnite, and a pyrite concretion has formed at its opening. 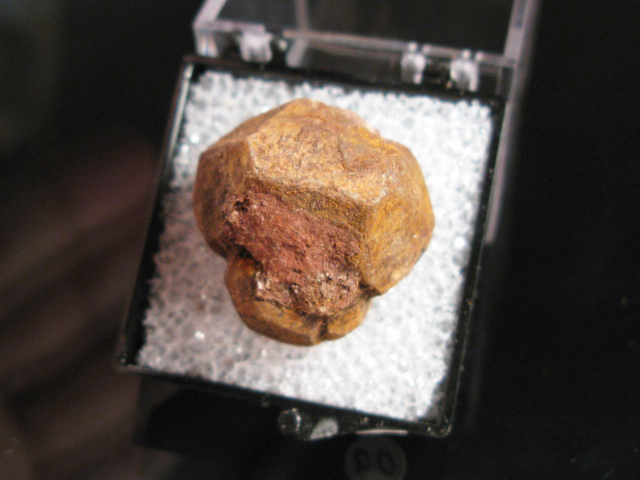 I only saw one other matrix example, but it had been repaired. 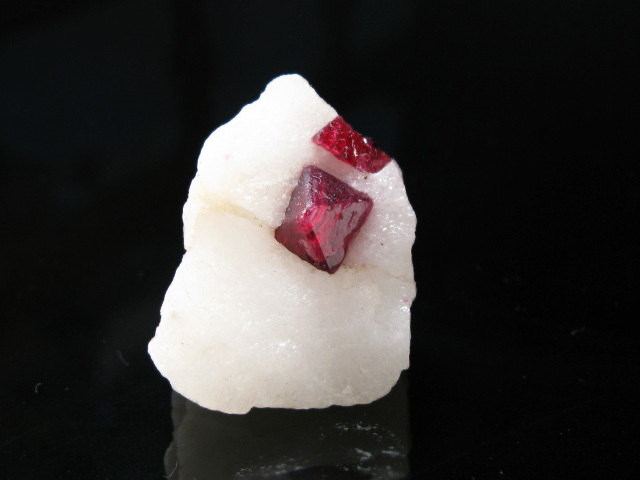 It reminds me of a fishing bob. 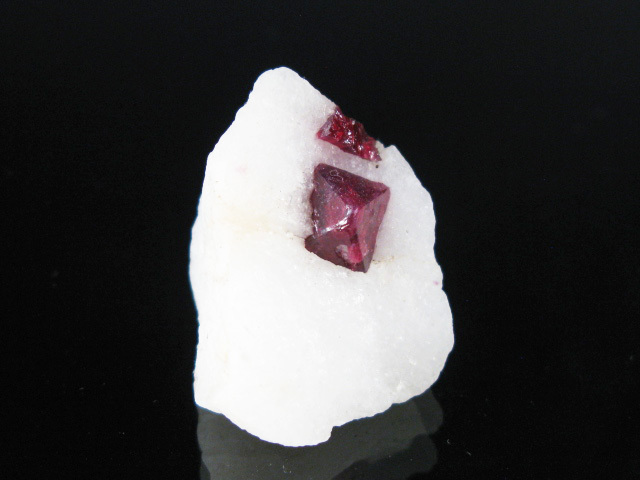 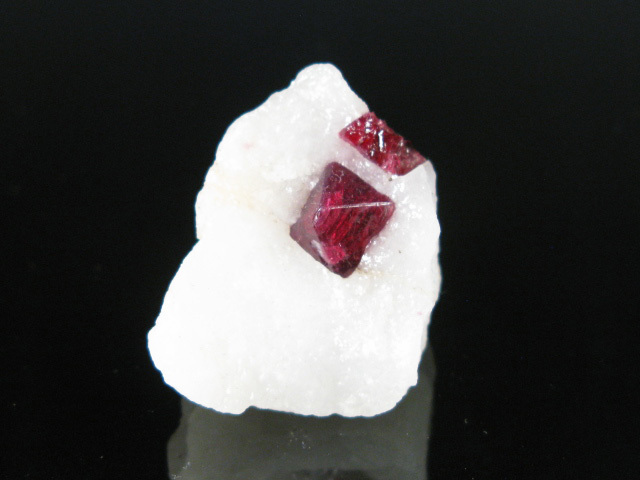 A beautiful red spinel octahedron on a starkly contrasting white matrix, from what has to be the most famous locality for the species. 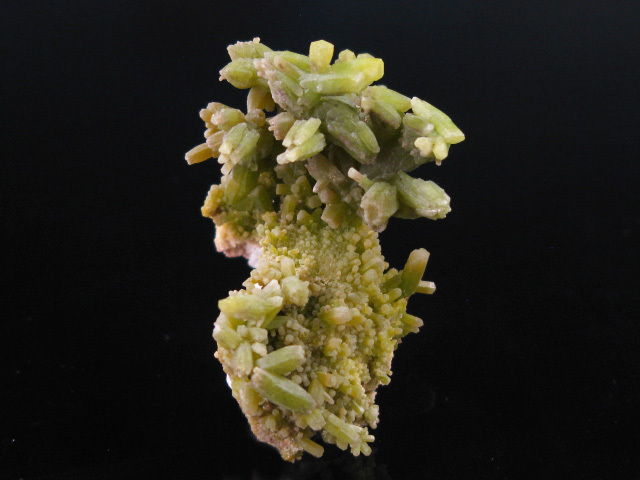 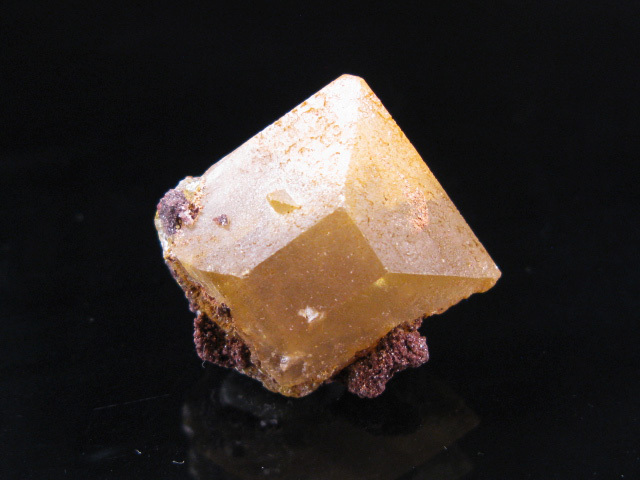 A well formed and rather sizable wulfenite crystal from a relatively new discovery in Congo. 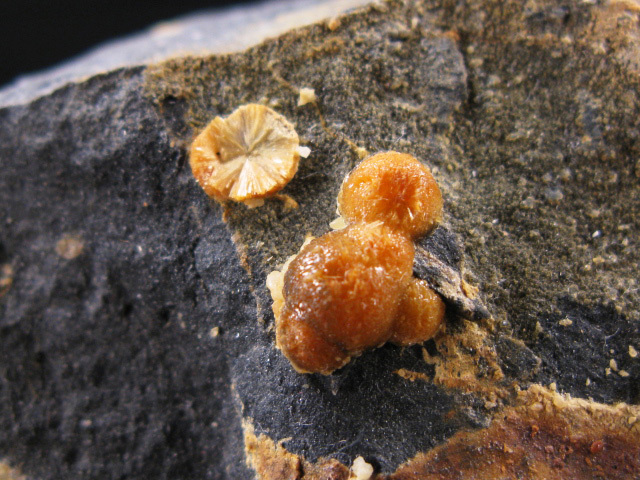 This location also produced a small amount of mimetite and hemimorphite, but the best thing to come from the location (in my opinion) have been these wulfenites. 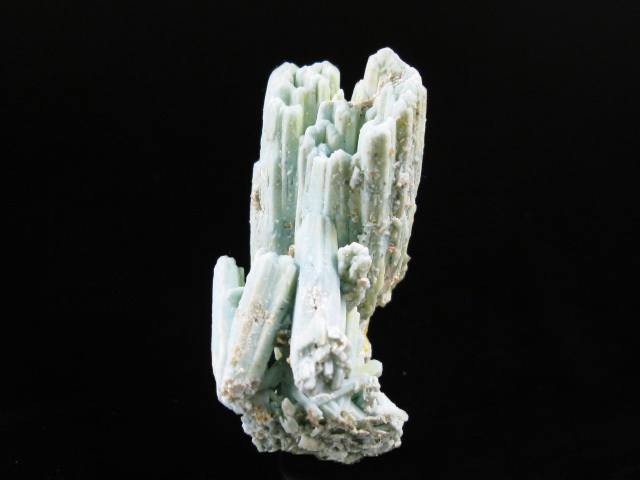 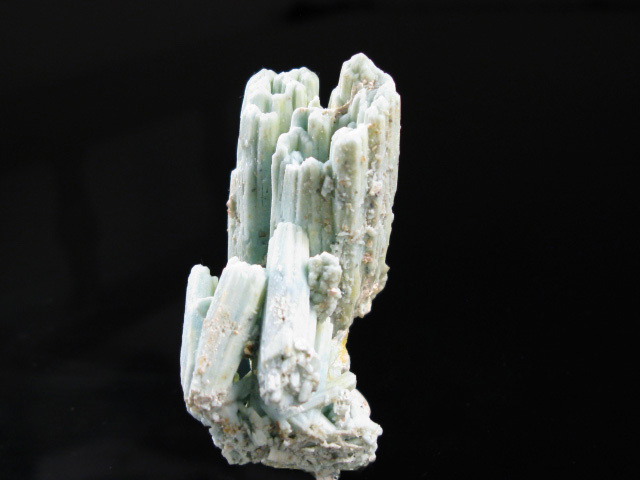 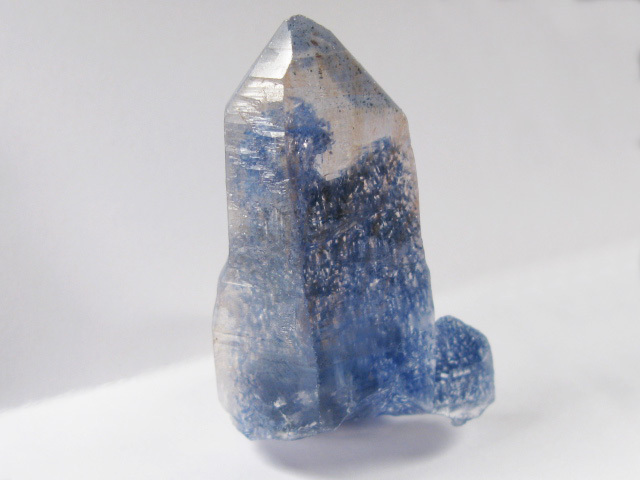 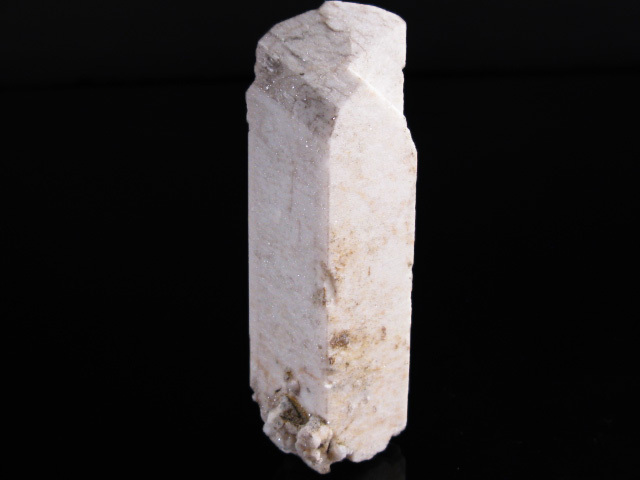 Few localities around the world have produced such sizable and sturdy crystals-- the bulk of the examples from the Southwestern US and Northern Mexico are usually just thin blades, and the couple localities that are exceptions to that rule (like Los Lamentos) rarely if ever produce crystals that are both large *and* aesthetic crystals. 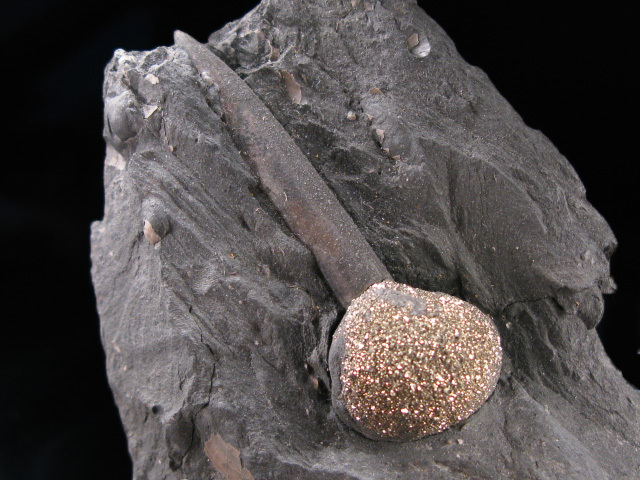 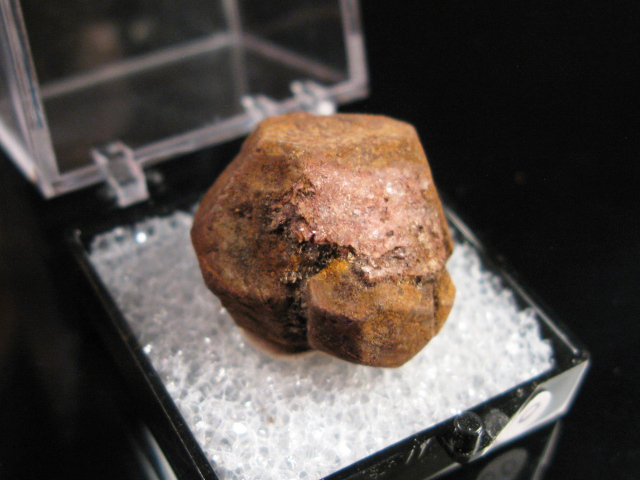 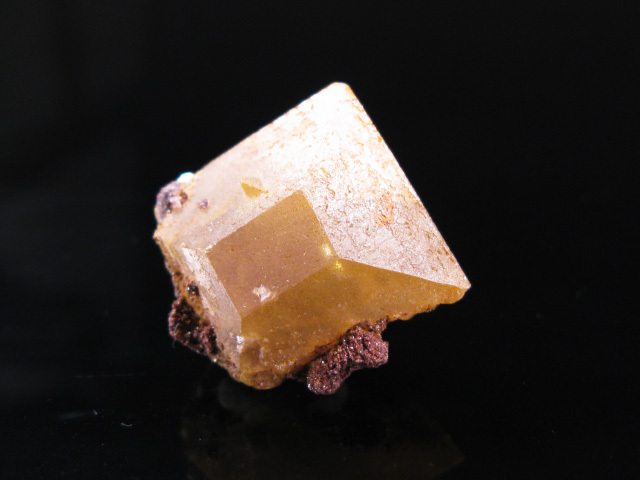 A well crystalized example of copper from the Upper Peninsula of Michigan. 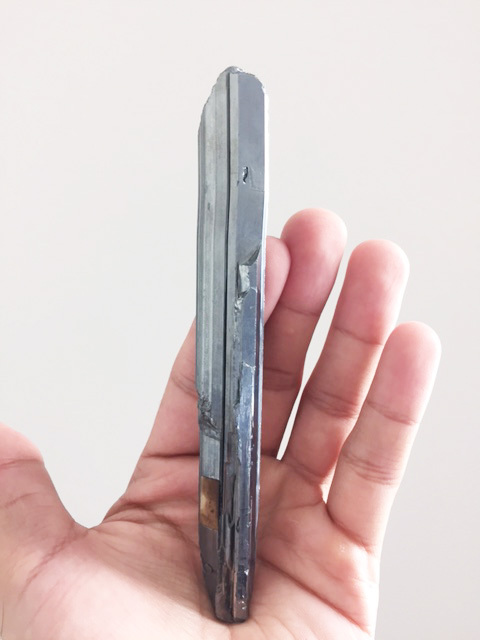 One of only a few pyrite/ Japan law twin combination specimens I was able to get. 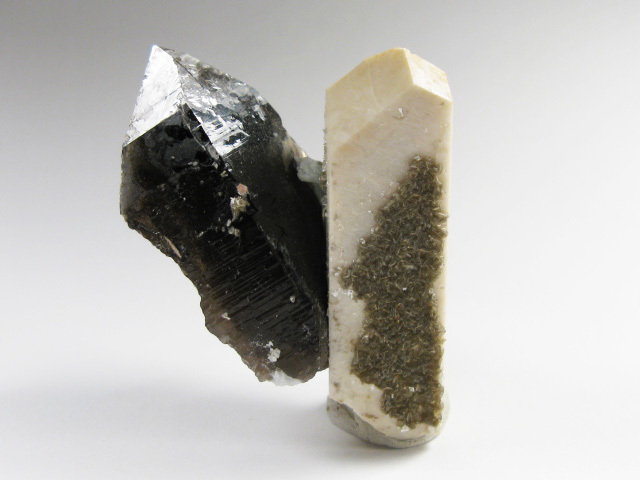 Japan law twins from Huanzala are unheard of-- this mine has produced literally thousands of tons of specimens over the last 40+ years, though Japan Law twins are virtually unknown from there. 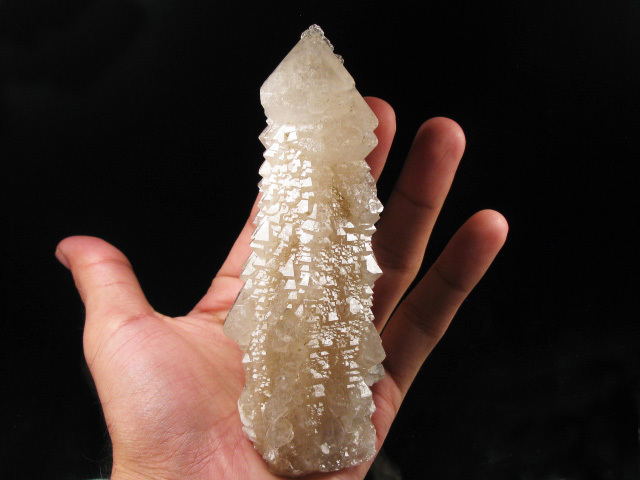 I certainly haven't seen any, and my (much more experienced) middle aged friend in Peru who has been specializing in Huanzala material since his early teens had never seen one before either. 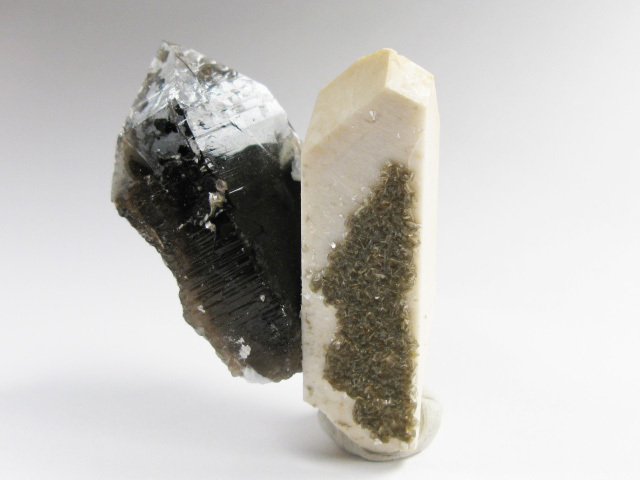 This one has saw marks on the reverse/ side and the twin is a bit more hidden, so it's a bit cheaper than others I have posted-- still, it's a beautiful combination, and these pyrite quartz/ combos have never been especially abundant from Huanzala. 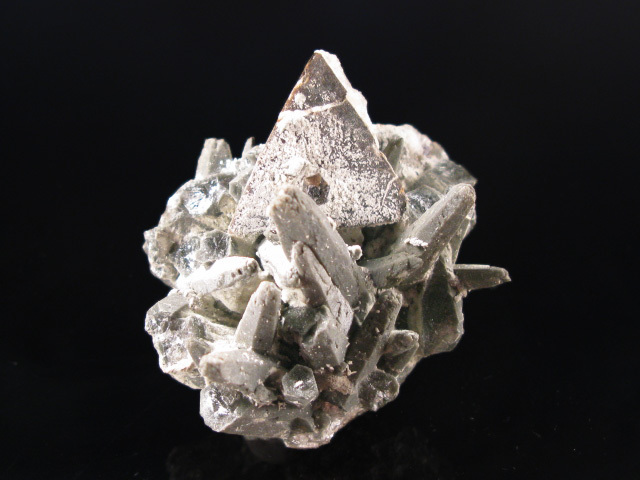 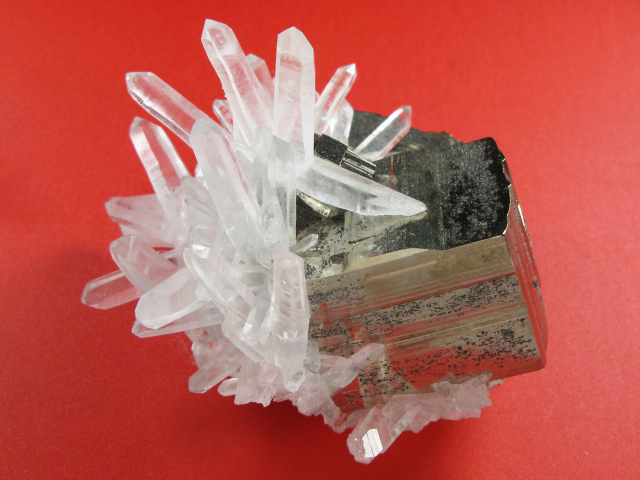 A very large genthelvite crystal, on a quartz matrix. 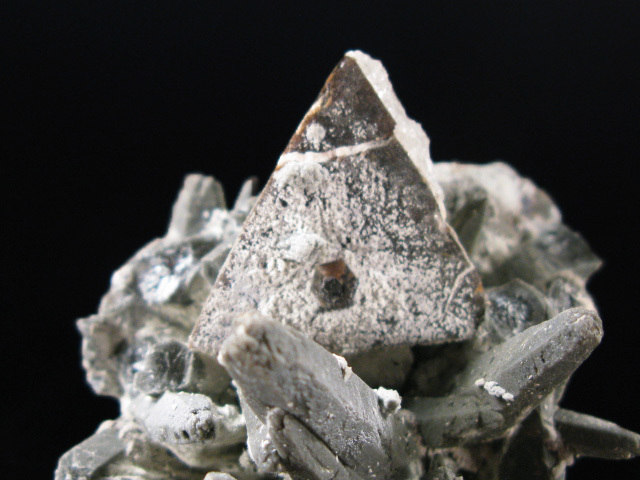 Most of the larger genthelvite crystals from Huanggang were compound crystals and clusters, but around 4 years ago there was a very small find of these single tetrahedrons at the Chaobuleng Mine. 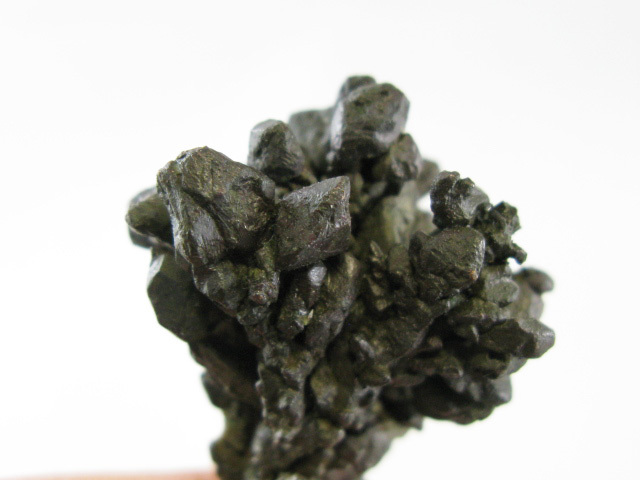 I only ever saw a few examples of this material, and this is probably one of 2 that I have seen on matrix. 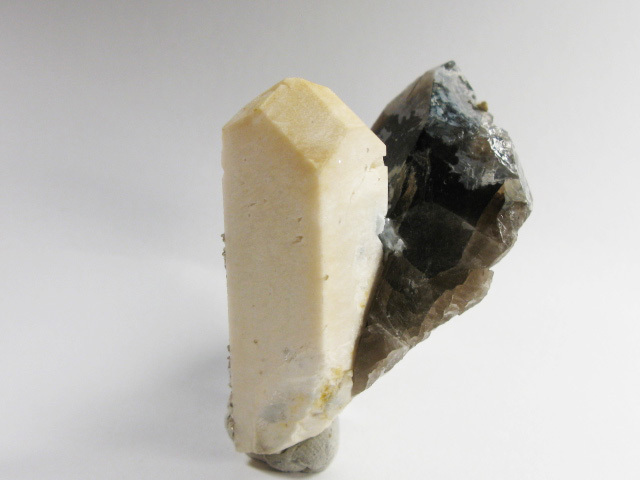 There is some damage to the quartz, but the piece is exactly as shown. 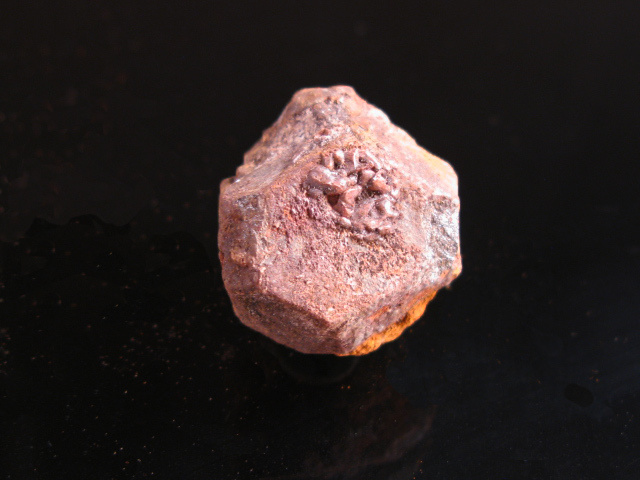 A very unusual and playful little specimen, half mineral and half fossil. 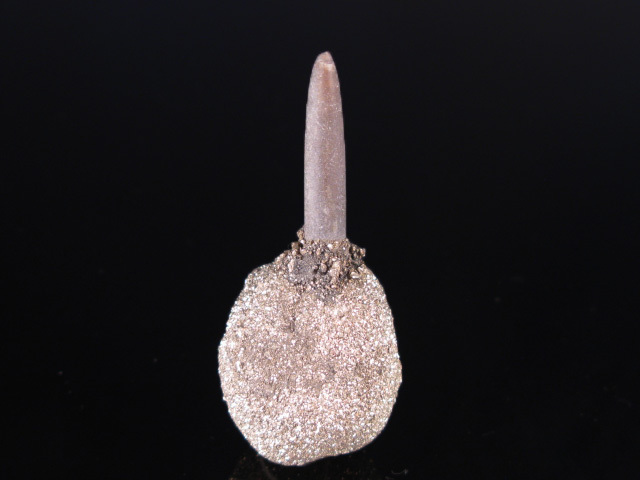 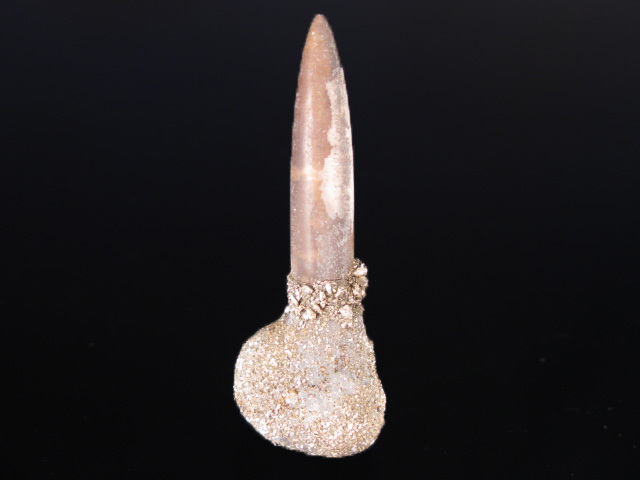 The tube-like shaft is the remnant of a squid-like creature called a belemnite, and a pyrite concretion has formed at its opening.There have been more of these offered since the initial find, but almost all are repaired-- this one is not. 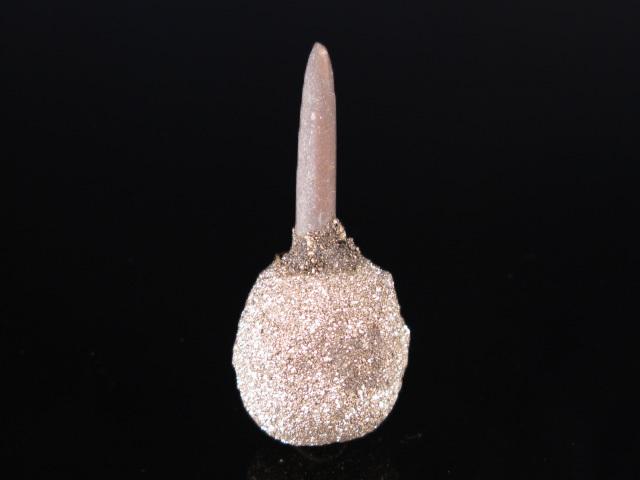 It reminds me of a fishing bob. 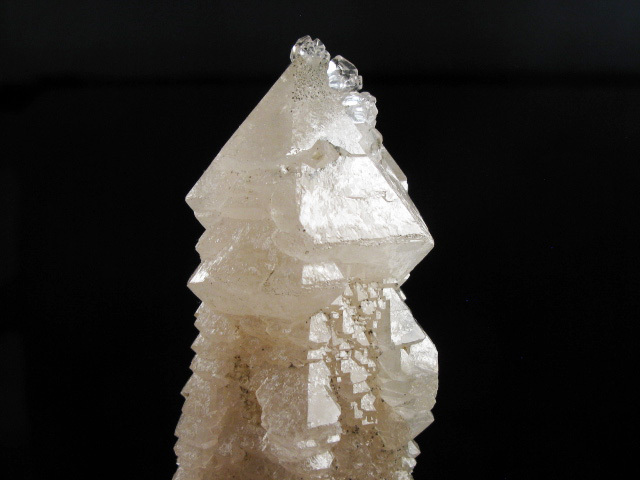 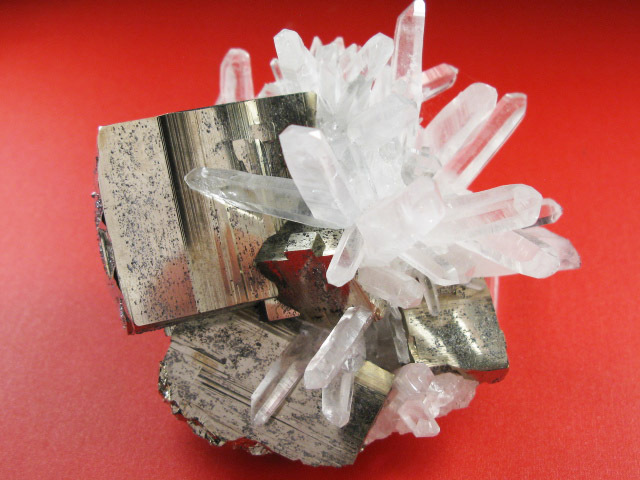 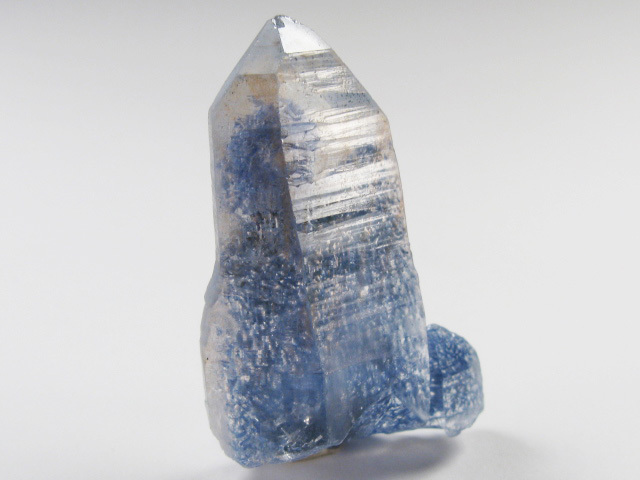 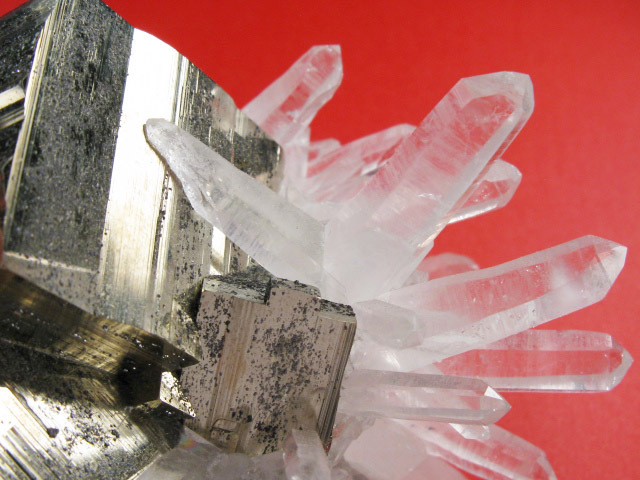 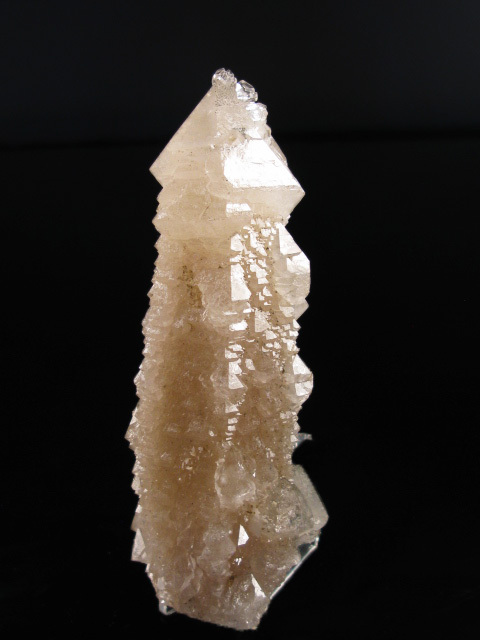 A sizable and well-terminated quartz crystal from the Huanggang Mine, displaying the complex lateral faces typical of examples from this locality. 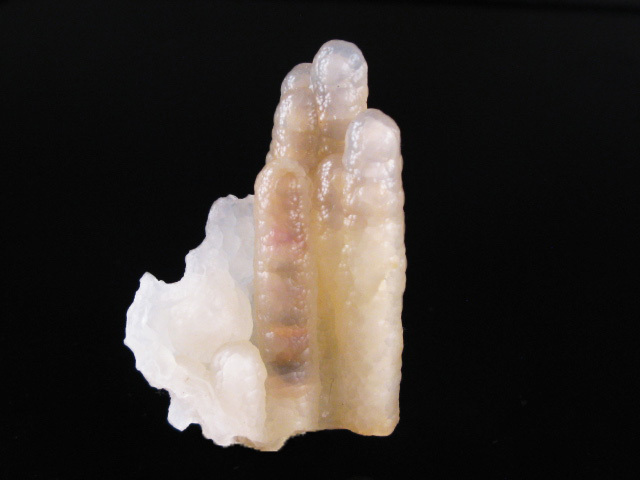 A very beautiful and highly unusual example of stalactitic chalcedony from the "bamboo agate" locality. 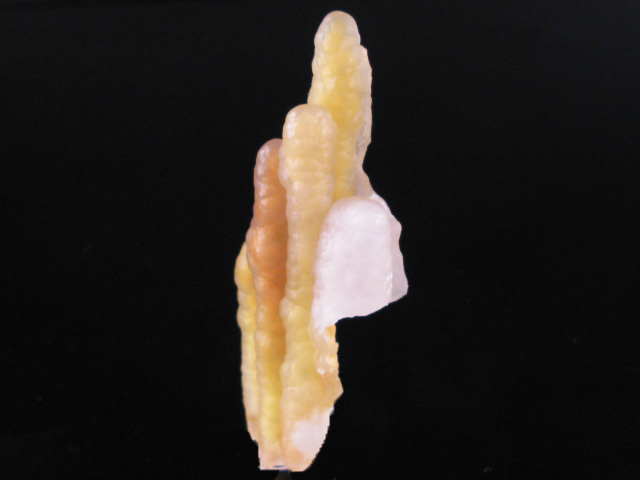 Most are yellow to colorless, but this one has a very interesting patchy appearance, caused by the deposition of multiple laters of chalcedony. 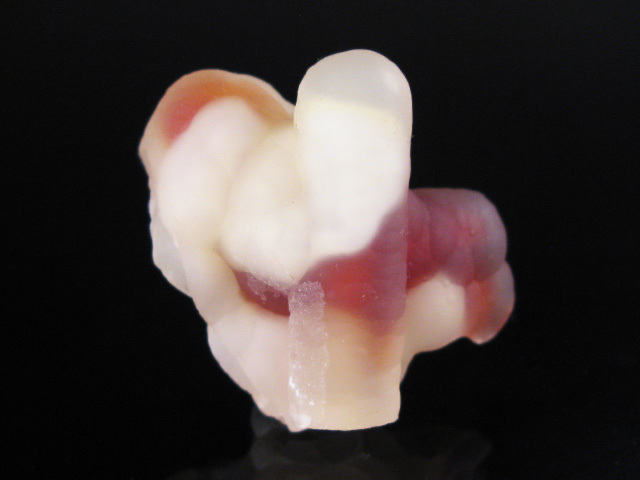 If you look at it from the back/ side, you can see that the first 3-4 mm layer imparted the red coloration, then the white and yellow were present in a subsequent overgrowth. 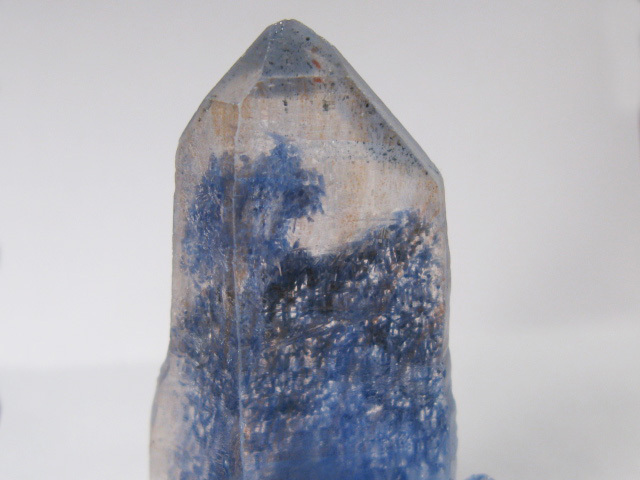 Ether way, it's really pretty and quite unusual. 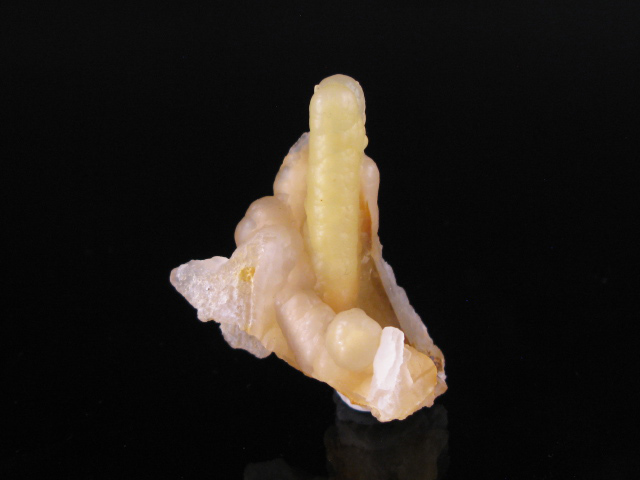 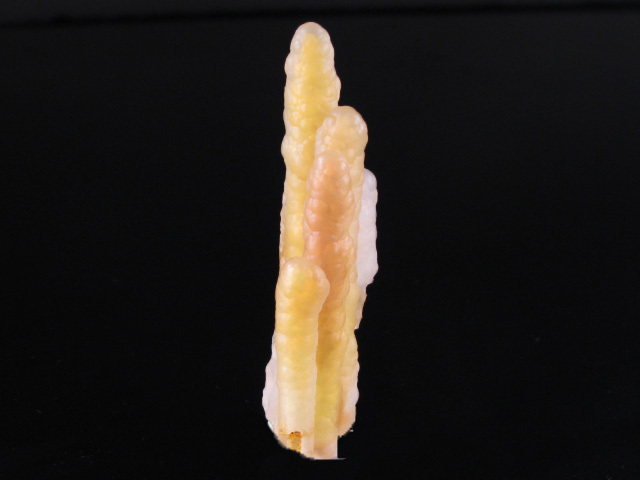 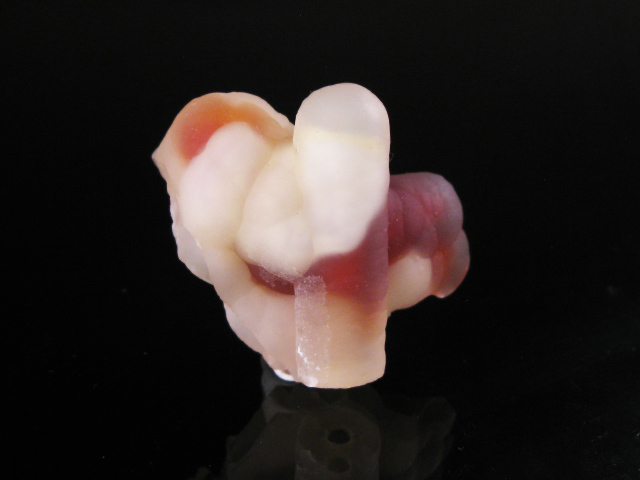 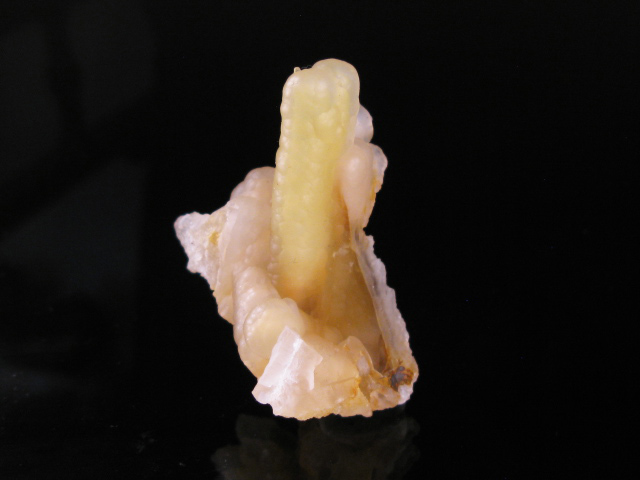 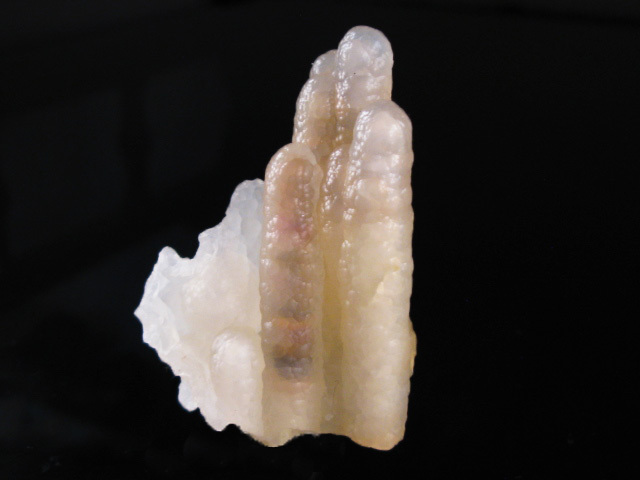 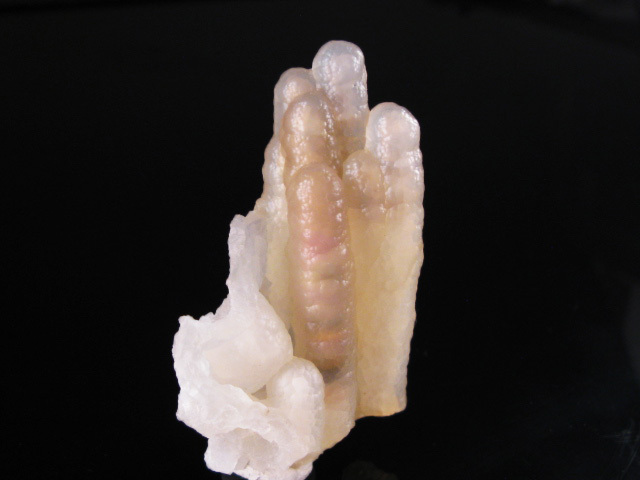 A very beautiful example of parallel yellow chalcedony stalactites. 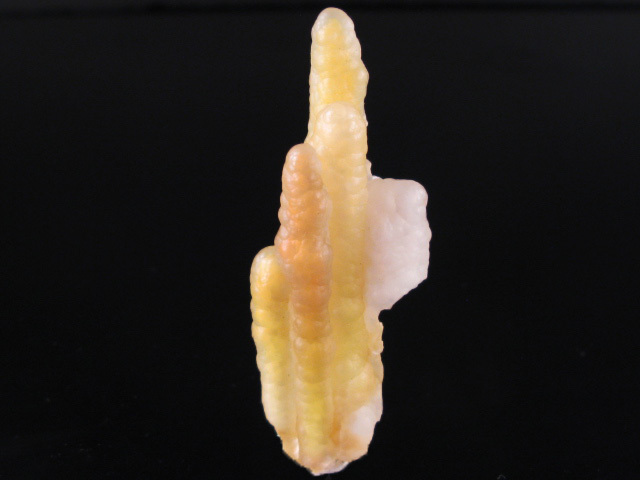 The bright yellow color is mostly contained in an earlier generation of growth, and a subsequent, slightly cloudy-white generation diffuses the color in a way that makes the specimen almost seem to glow. 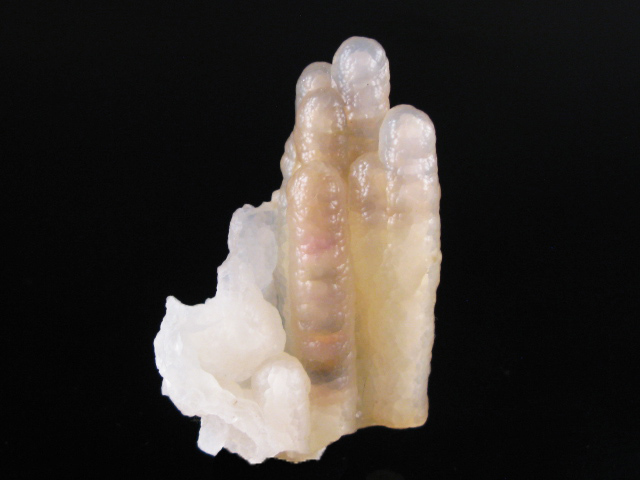 A nice cluster of lustrous chalcedony stalactites from the "bamboo agate" locality in Indonesia. 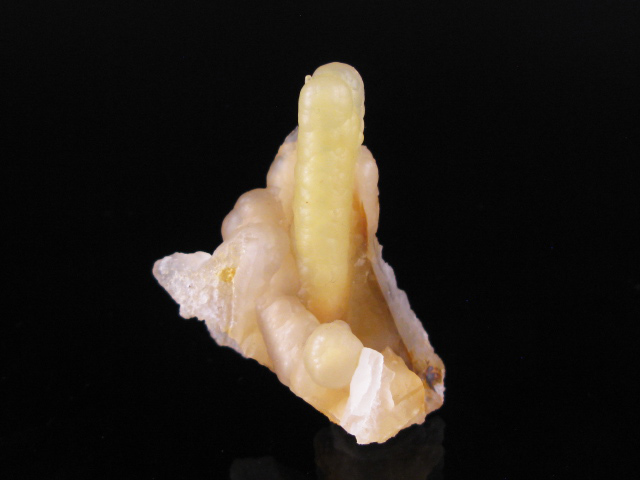 A very beautiful example of a yellow chalcedony stalactite form Indonesia. 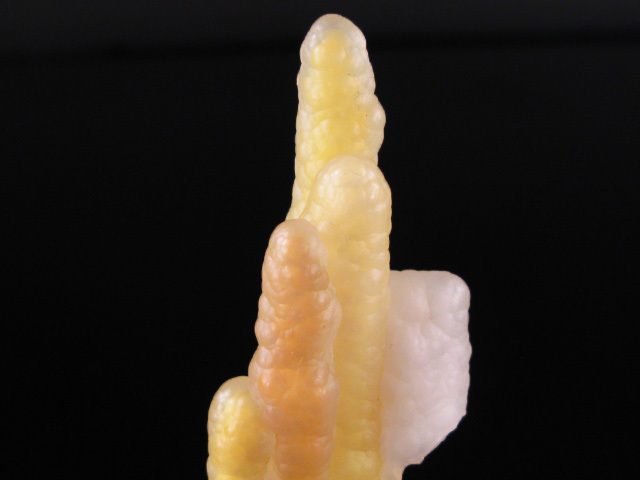 The bright yellow color is mostly contained in an earlier generation of growth, and a subsequent, slightly cloudy-white generation diffuses the color in a way that makes the specimen almost seem to glow. 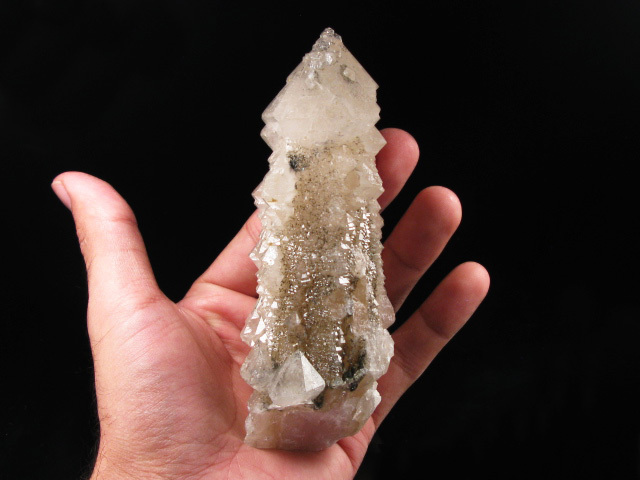 A beautiful and rather sizable single crystal from this find. 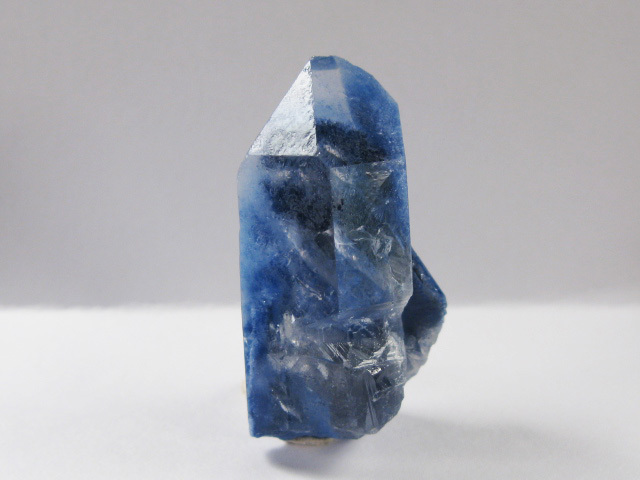 Many examples that have the blue inclusions more easily visible have actually been polished, but this one retains its natural surfaces. 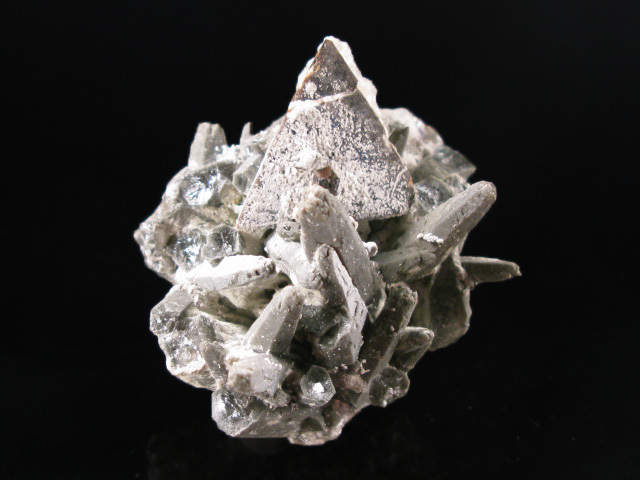 The dummortierite inclusions on this one are growing in from the back of the specimen, giving it a striking appearance from the front. 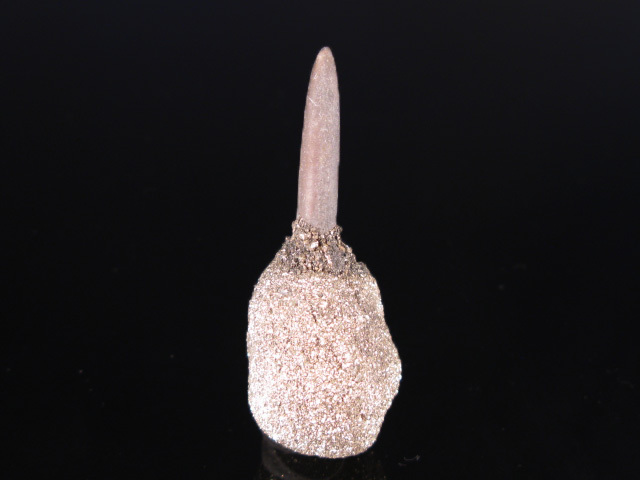 I did not see very many of these that were bigger than thumbnails, but this one makes it solidly into the "miniature" size category. 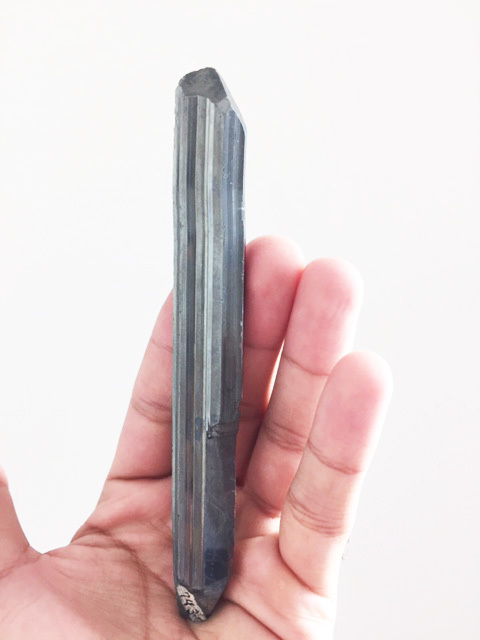 A beautiful single crystal from this find. 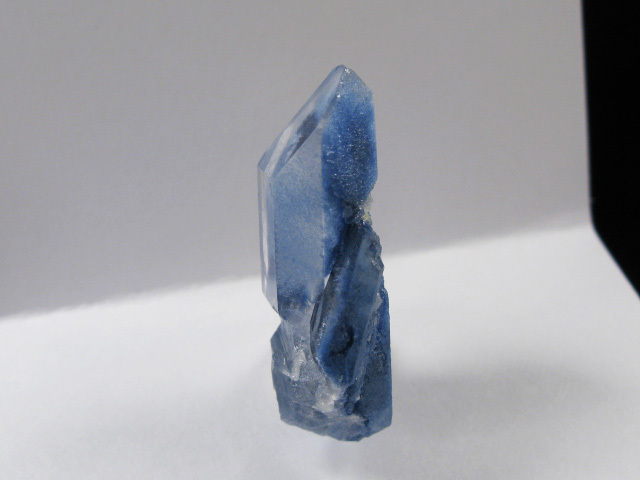 Many examples that have the blue inclusions more easily visible have actually been polished, but this one retains its natural surfaces. 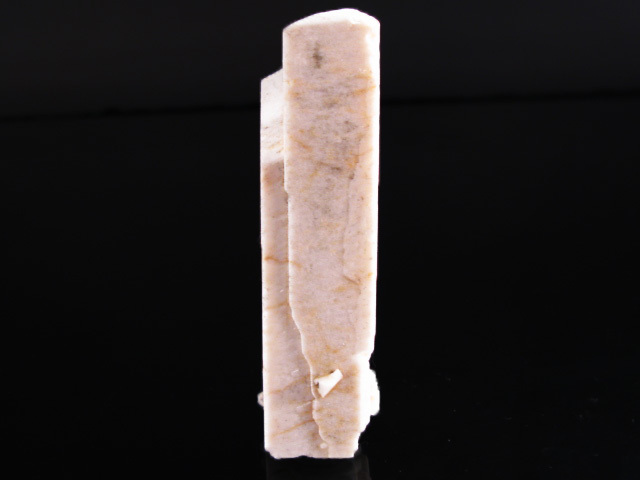 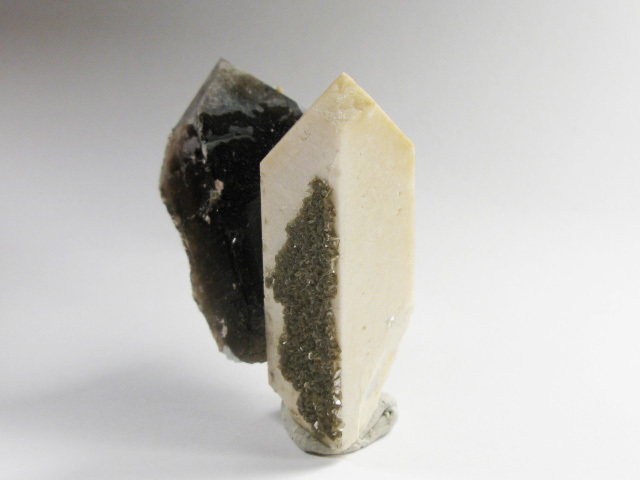 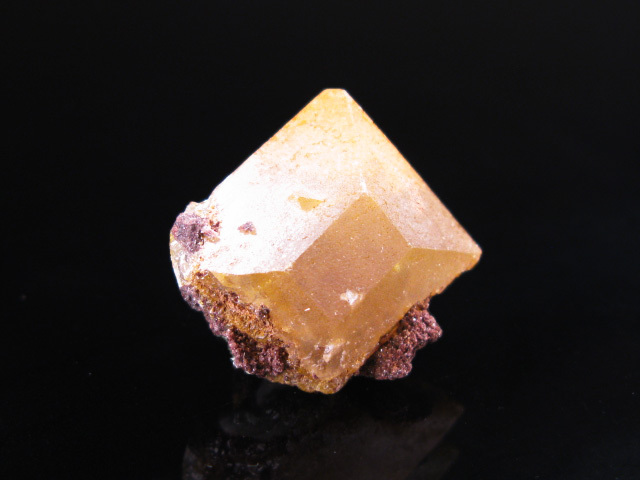 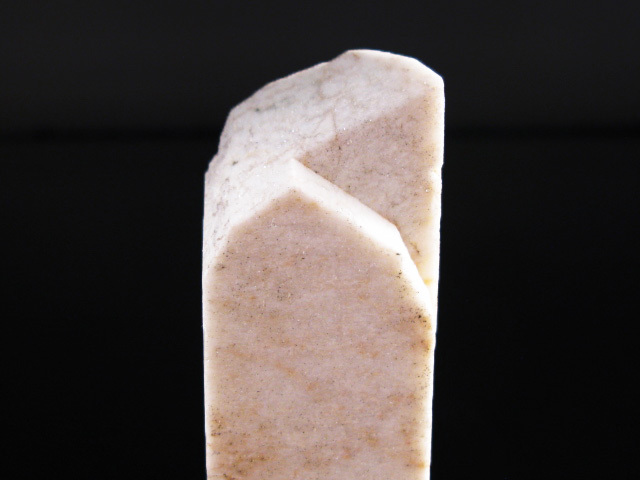 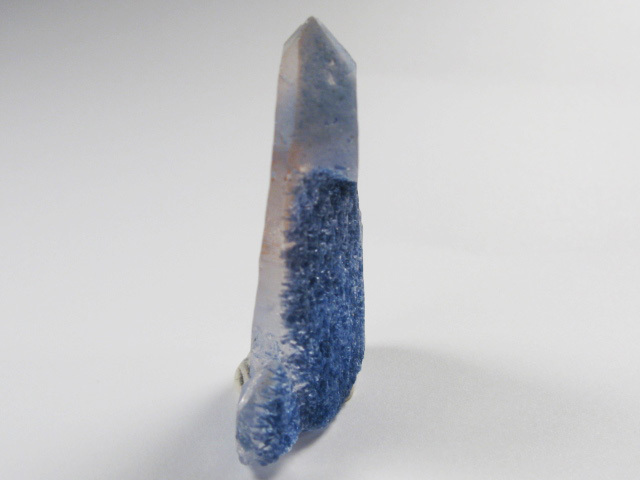 A very sharp feldspar crystal with a partial smoky quartz, from Japan. 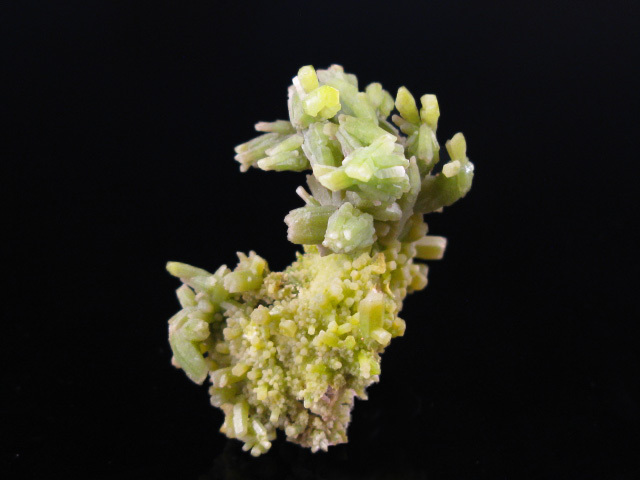 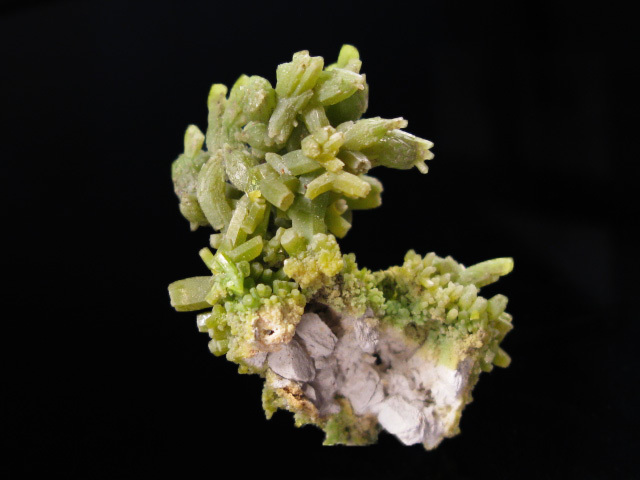 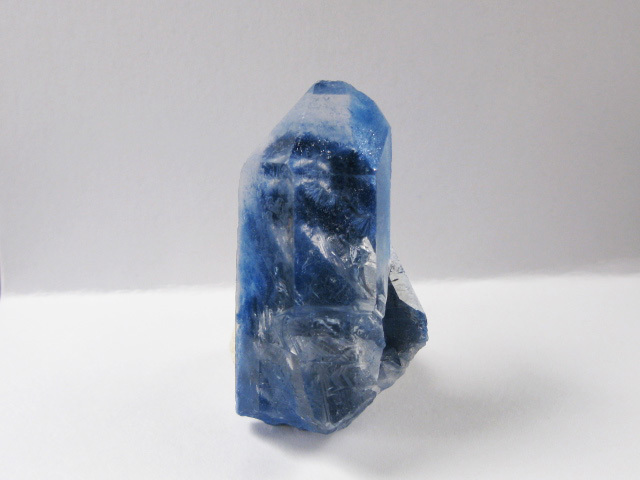 A nice crystal of radioactive betafite, from he locality that is widely recognized s having produced the best samples of this species. 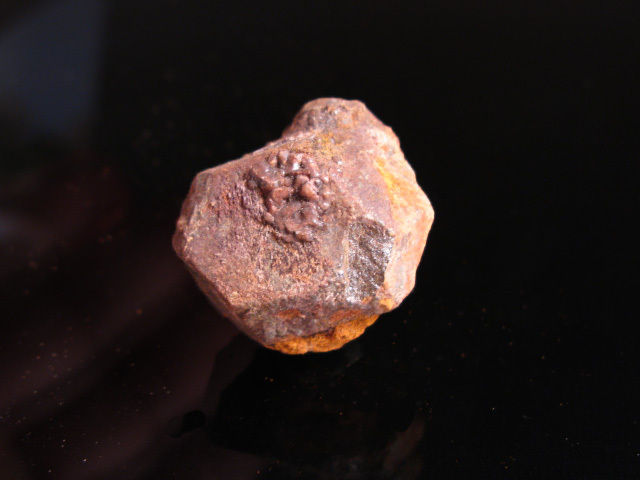 Although they are found relatively close to the United States in an area where field collecting is still possible, the emphasis on "border security" over the last several years has made these a bit of a headache to bring into the country. 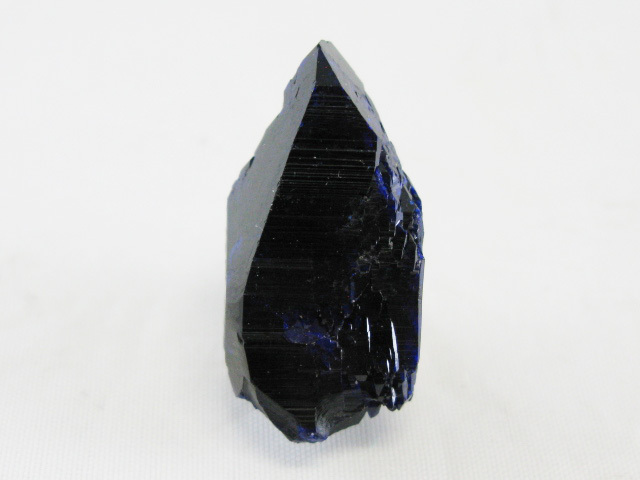 I have heard a couple first hand accounts of collectors detained at the border and searched, because apparently these are radioactive enough to set off the particular sensor at the nearest border crossing... so now people don't try to bring them in anymore. 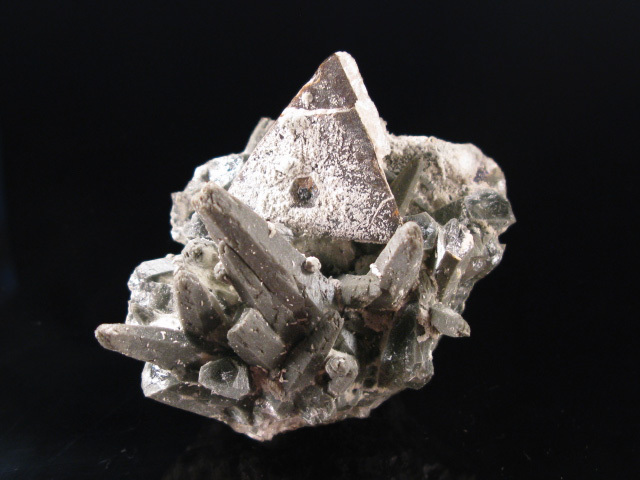 A great example of valentinite from this recent find-- I've seen ugly partial pseudomorphs after stibnite from this location, but actual primary crystals have remained rare. 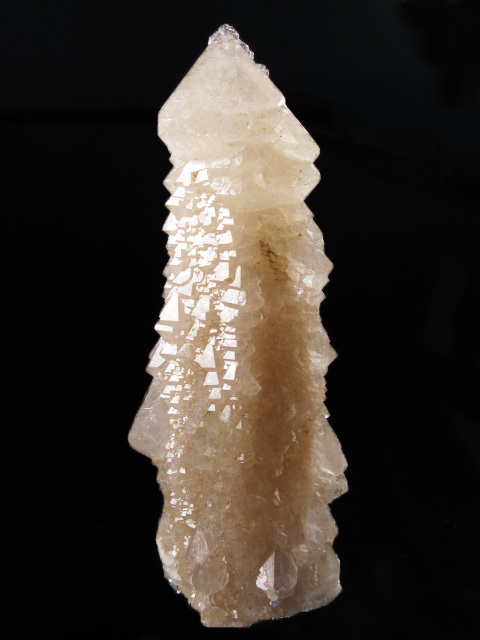 The clusters on this piece seem more compact and heft than most-- the bulk of what I have seen have been delicate looking, acicular needles. 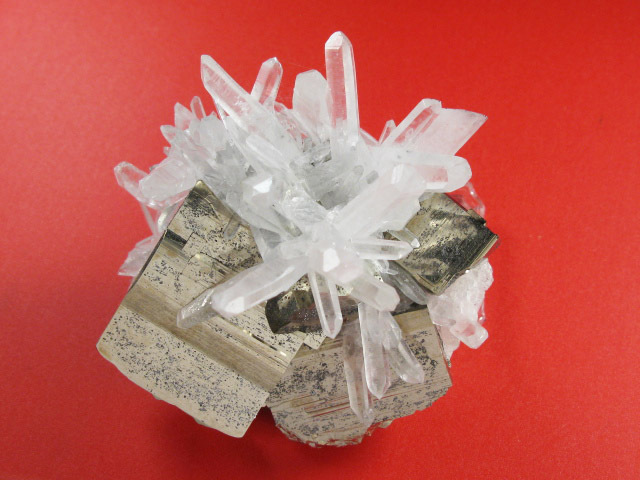 These clusters are almost solid balls. 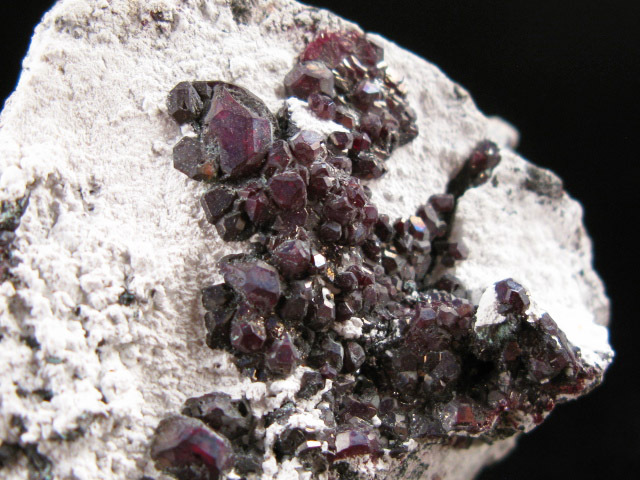 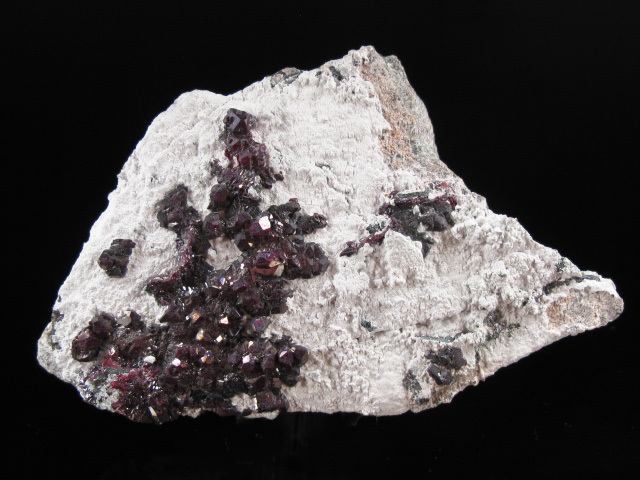 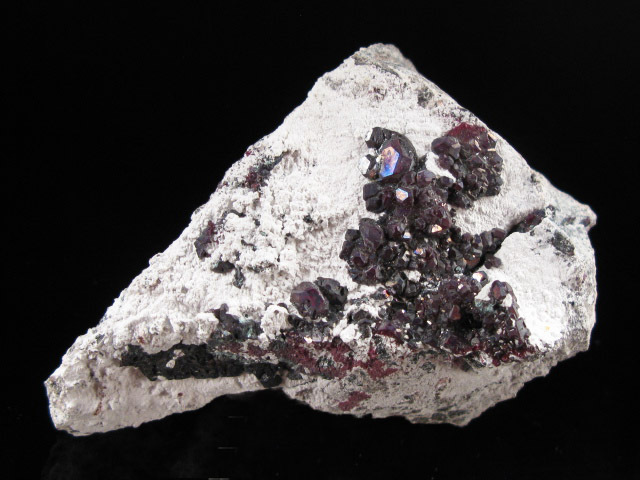 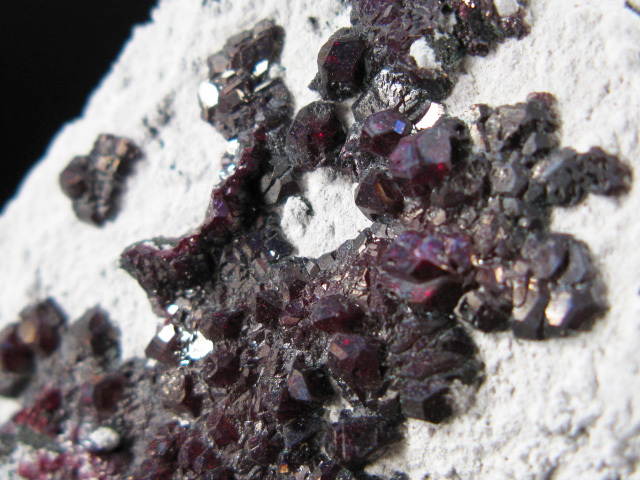 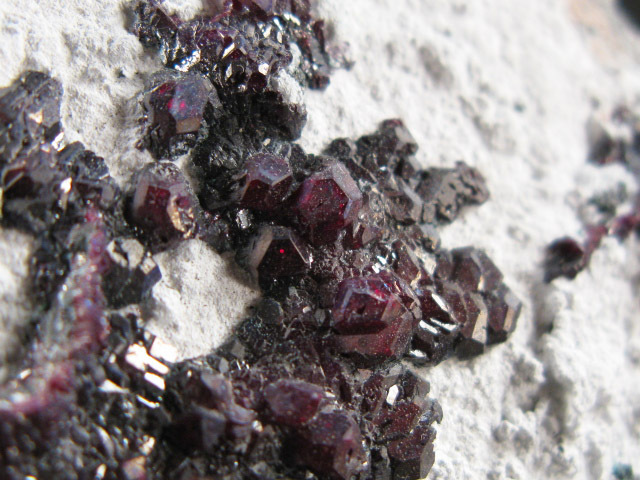 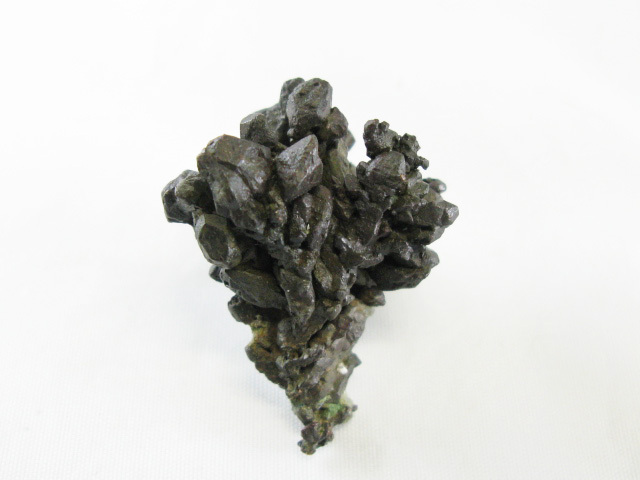 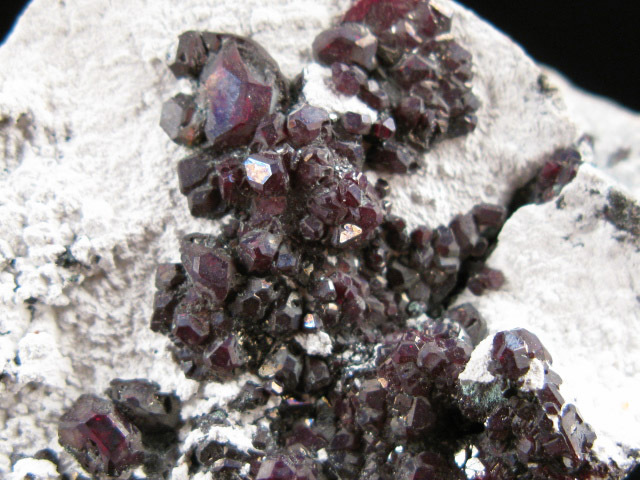 A nice specimen of cuprite form the Milpillas Mine, hosting numerous flattened crystals on a white matrix. 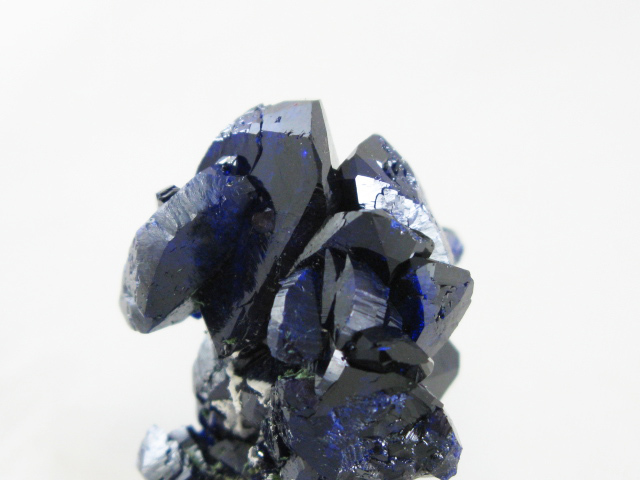 These have been really expensive regardless of whether or not they have decent color (these look metallic)-- I think it has something to do with them being from Milpillas, as for a while anything from there seemed to carry a premium. 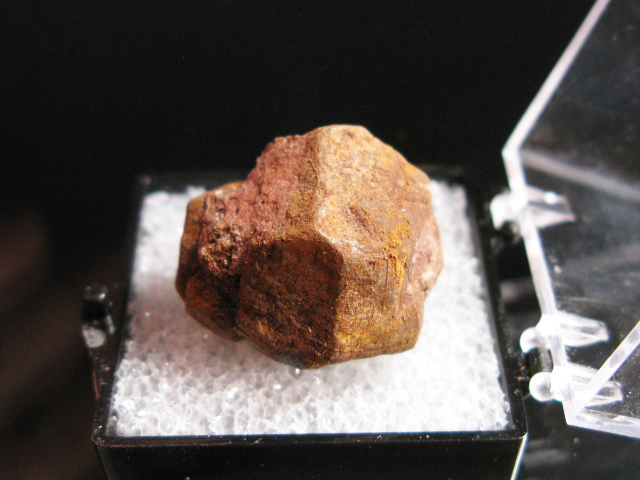 In any case, this is a relatively good representative specimen, of decent size, and what I think is not a bad price. 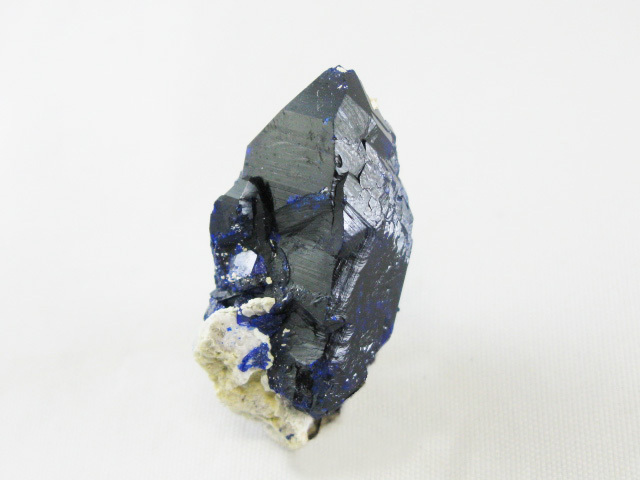 A well formed, sharp, blocky azurite crystal on a bit of matrix. 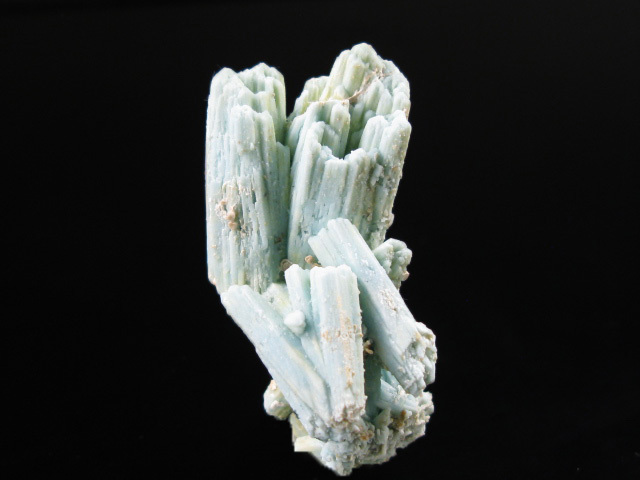 It has been said many times about these Milpillas azurites, but they truly look like the Thumb pieces from decades ago. 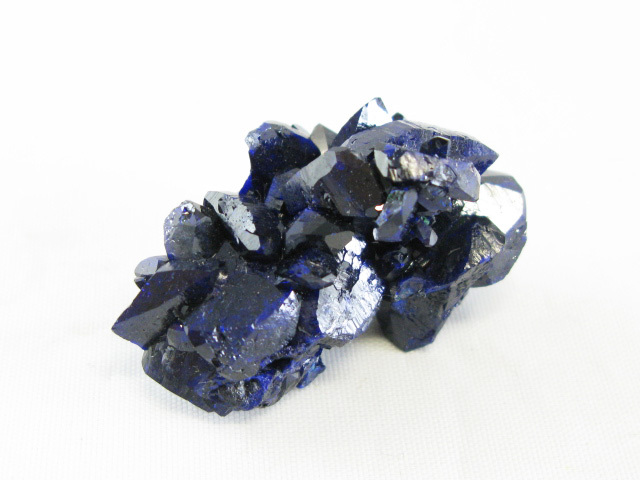 A cluster of sharp blue azurite crystal from the now depleted deposit at Milpillas. 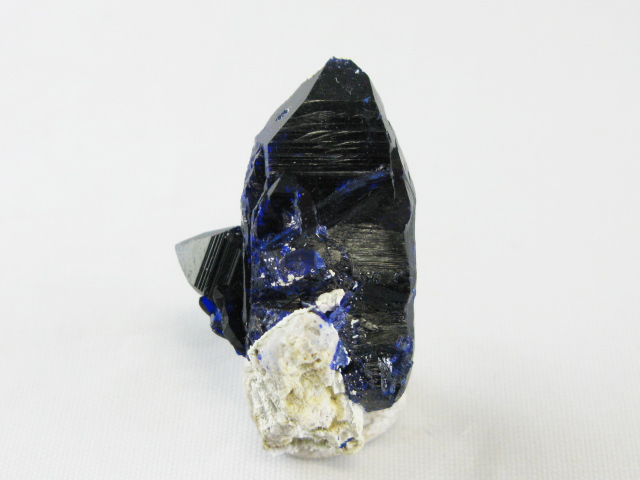 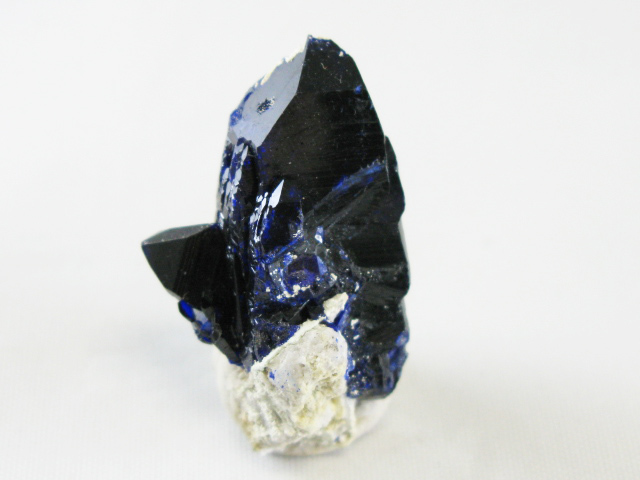 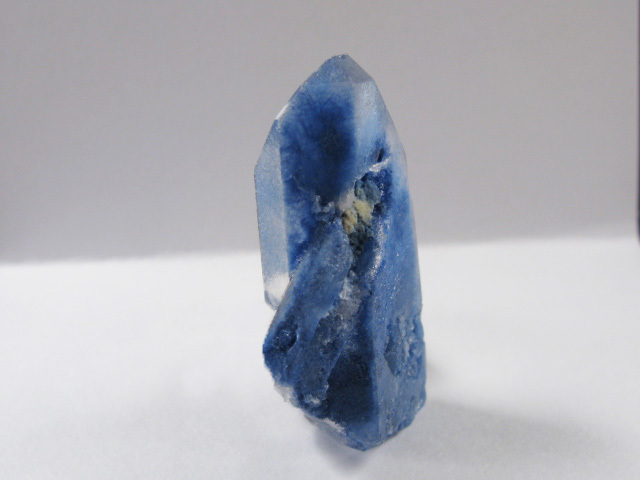 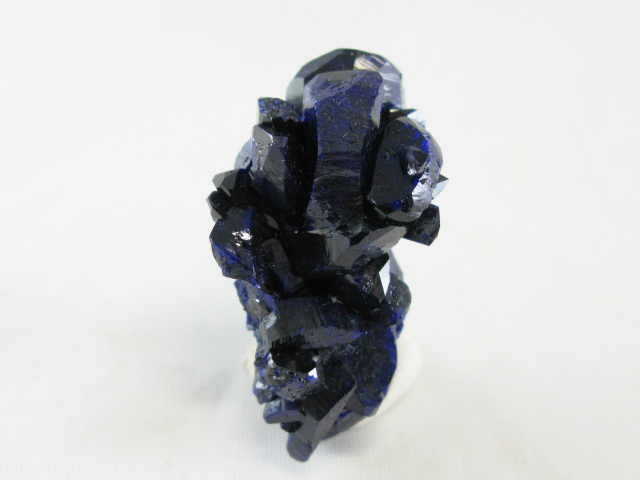 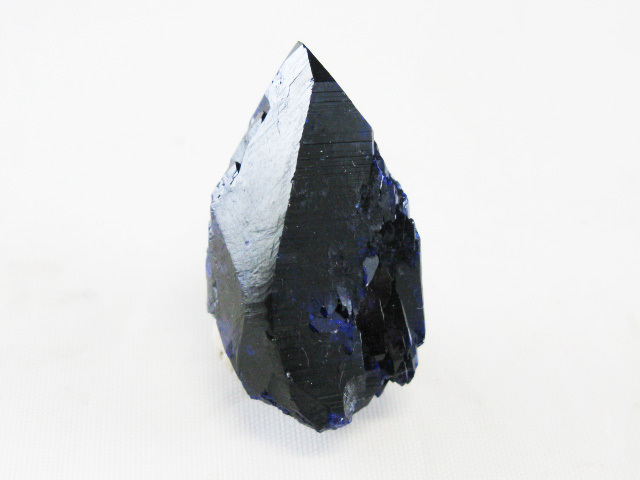 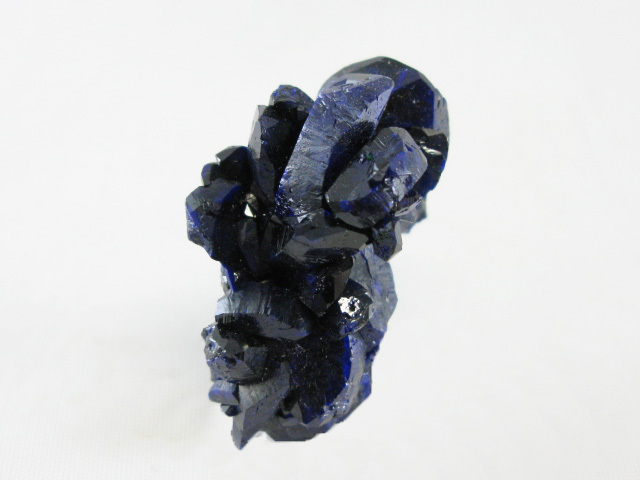 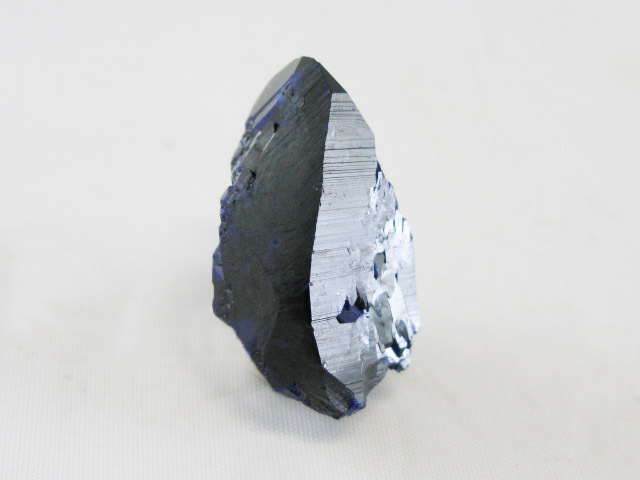 A well formed, sharp azurite crystal. 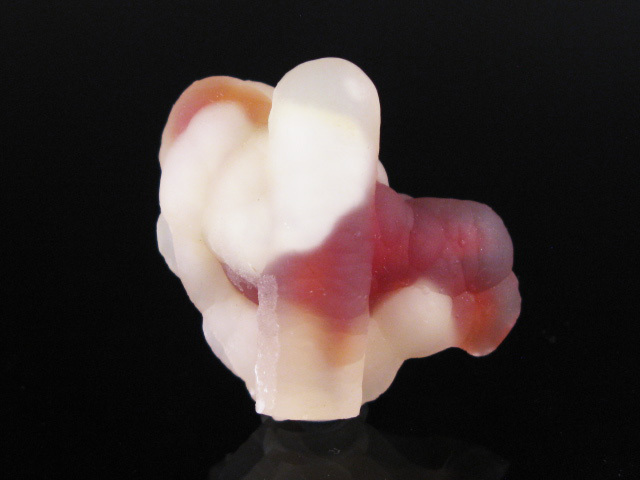 Complete all around, except for the bottom where it was removed from the matrix. 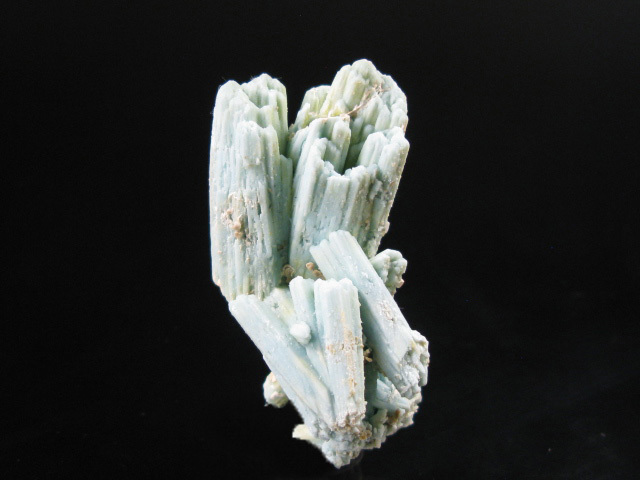 It has been said many times about these Milpillas azurites, but they truly look like the Thumb pieces from decades ago.